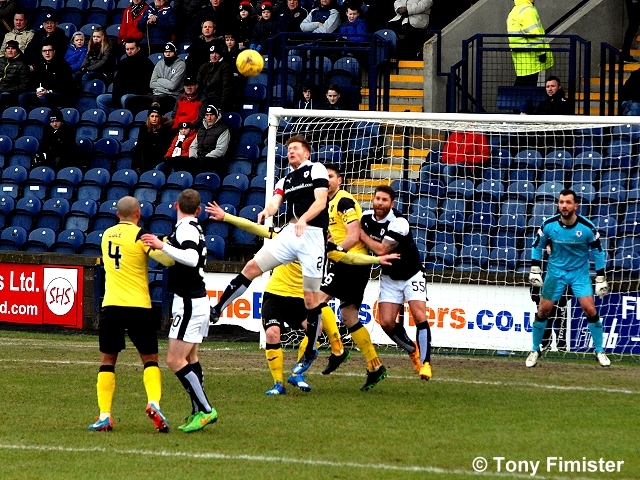 Raith moved back in to the play-off places in the Scottish Championship with a deserved but hard-earned three points over an energetic and obdurate Livingston side at a wintry Starks Park this afternoon. 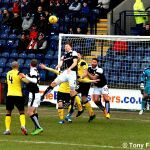 Goals from Mark Stewart and Aidan Connolly moved Raith above Queen of the South in the league, and arrested the worrying slide in form Raith have suffered since the New Year. 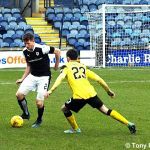 While moments of quality were few and far between, Raith’s overall work-rate and sharpness upfront edged them ahead of their West Lothian opponents, whilst the visitors will reflect on a number of second half missed chances. 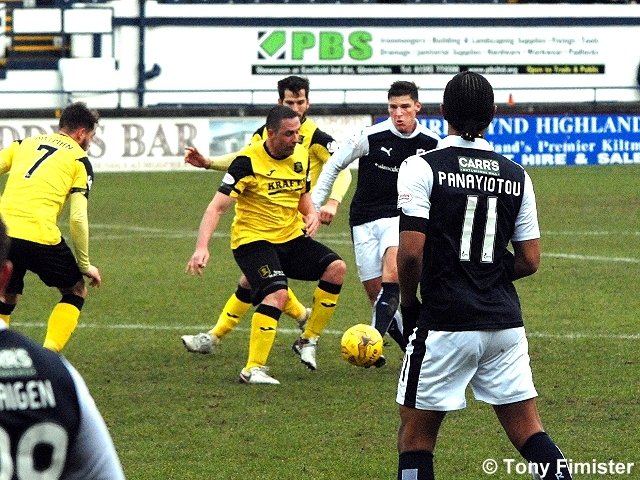 Manager Ray McKinnon was pressed into a number of changes for this afternoon’s encounter. Injury and suspension ruled out centre halves Toshney and Benedictus – Craig Barr had an assured first start of the season deputising alongside Ian Davidson. 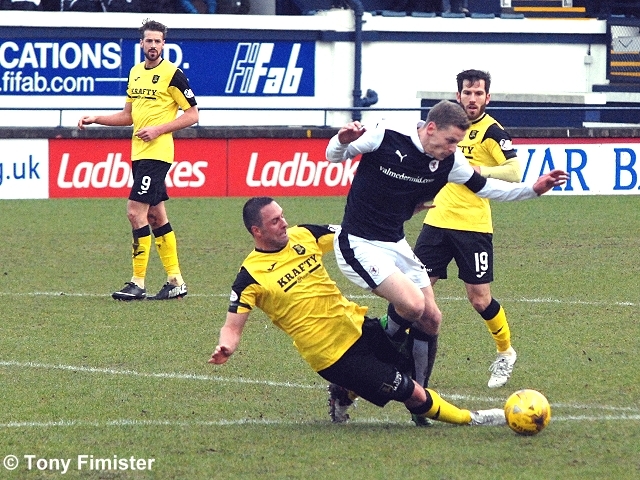 Jason Thomson started at right-back, bombing forward several times in the first ten minutes, reminding the home support of the options missed during his lengthy injury lay-off. Mart Stewart started upfront with loanee Panayiotou behind. 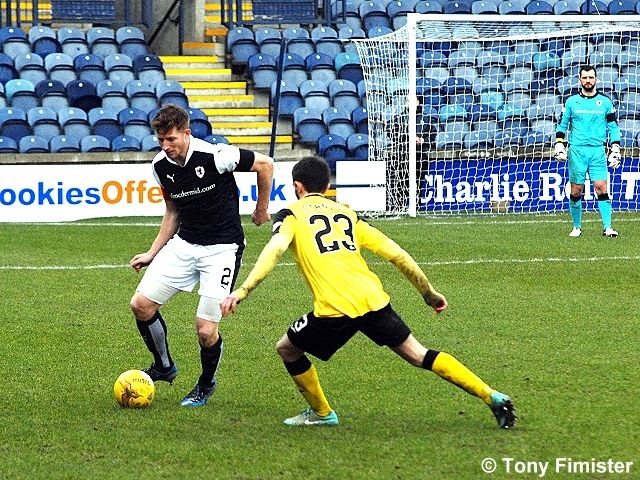 Rangers’ teenager Ryan Hardie took his place on the bench, and would make his Rovers debut in the closing stages. 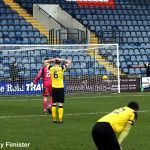 Livingston’s recent form has been disappointing – high points such as last week’s goalless draw with promotion-chasing Hibernian have been outnumbered by disappointing defeats. Before kick-off, the visitors were four points clear of Alloa at the foot of the table, and five behind Dumbarton in eighth place. Having said that, manager David Hopkin had been busy with recent transfers – Queens’ Park Rangers’ full-back Osman Kakay had joined on-loan with Charlie Telfer (Dundee Utd) and Sam Stanton (Hibernian) also joining till the end of the season. Top scorers White and Buchanan started upfront, with the robust Fotheringham anchoring a four-man midfield. The match began following warm tributes to Raith’s Ally Gourlay from former players, and a minute’s applause prior to kick-off. 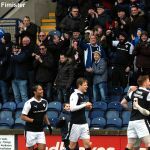 With the home side sporting black armbands and the club flag flying at half-mast, a dedicated and energetic home performance was needed to lift spirits amongst the Raith supporters and staff alike. Beyond Thomson patrolling the right-flank, and some neat interchanges between Panayiotou and Connolly in forward positions, there was little to report in the opening ten minutes. Stewart scampered after a Connolly flick, with Livi keeper McCallum claiming well; at the other end, Buchanan squared after being released by a sharp Mullin through-ball, with Cuthbert securing his six-yard box under pressure. Tipping rain began to fall minutes after kick-off. Combined with a blustery wind, several gentlemen of the press required to take evasive action to protect laptops and other devices – your reporter’s traditional notebook and pencil survived the adverse conditions. 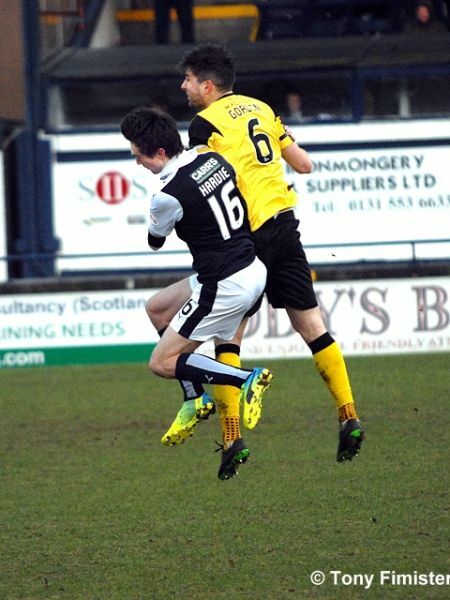 Livingston’s direct running caused the home midfield some problems early on. With Stanton and Mullin cutting inside regularly, and Buchanan and White turning with possession to drive forward, Barr and Davidson were frequently called in to make direct challenges. 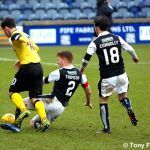 Robertson was booked after two fouls within seconds of each other: with the first, referee Collum played a good advantage to allow a Livingston attack to continue; the second – a clear jersey pull on an escaping White – drew an immediate yellow. Mullin blasted high over following a corner; Stanton fizzed a shot past Cuthbert’s post moments later. Raith, in comparison, were advancing more slowly. 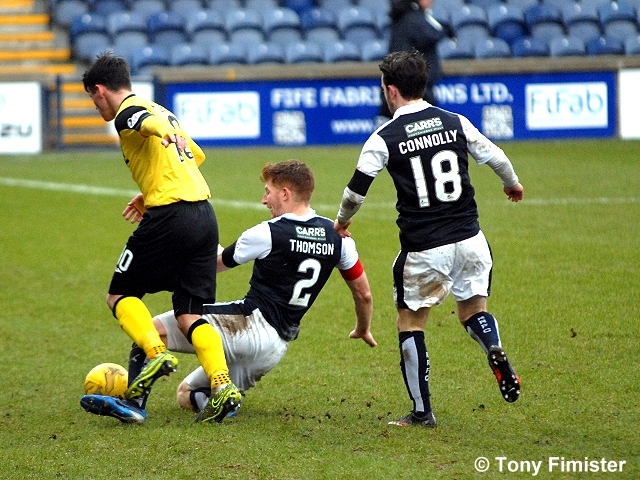 From a good tackle in his own corner, Callachan fed Connolly, who together with Panayiotou, McKeown and Stewart, all made lateral passes before running upfield – leaving Davidson to fire a cross-field torpedo well over Thomson’s head and out for a throw. 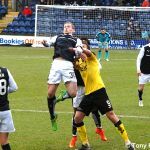 While a measured approach is to be applauded, often Raith’s “give and go” passing led frustratingly to a loss of possession. The first half saw more than one errant pass from the home side. 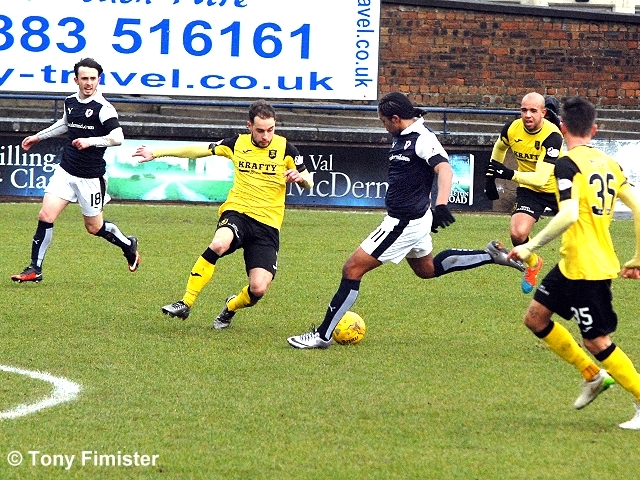 Mid-way through the half, Raith began to raise the tempo. 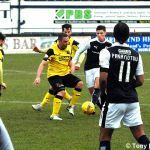 Panayiotou escaped and sought to play in Stewart, his blocked pass gave Connolly a race with Cole – the big Livi centre-half just clearing the danger in a tangle of arms and legs. On the half-hour, the first-half’s one moment of genuine quality – Panayiotou picked the ball up near half-way and stretched his legs with real purpose, exchanging a lovely one-two with Connolly before clipping a tremendous twenty-five yard shot against the underside of McCallum’s cross-bar – Cole gratefully thumped clear. The Central American midfielder, after being peripheral in the opening stages, was by now a central figure. 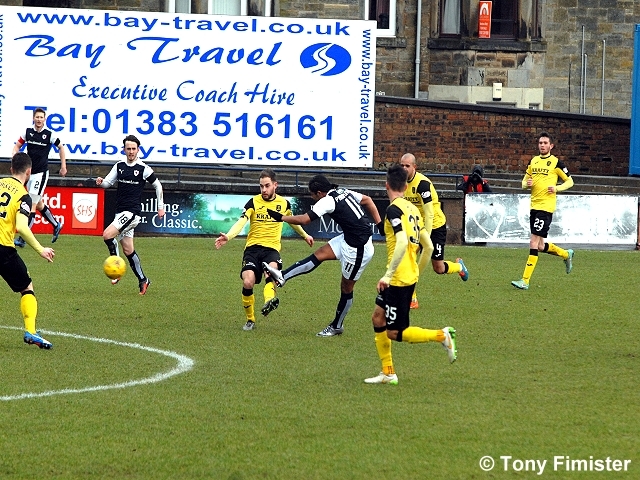 Having drawn Cole wide, Panayiotou offered Connolly an invitation to chase a deft flick inside – the diminutive Raith winger burst inside, his shot blocked by Gordon. 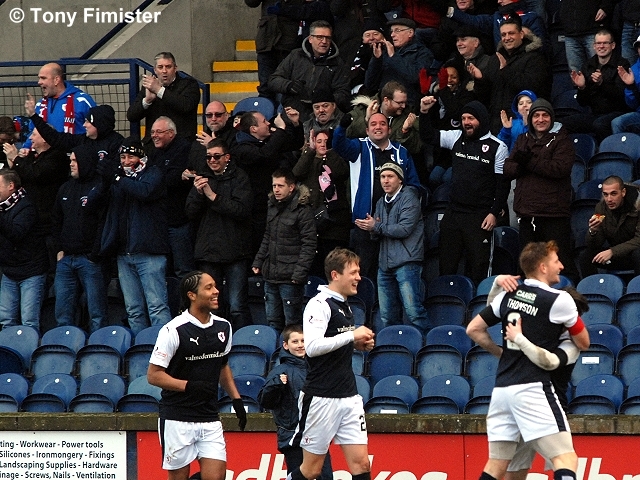 Having enjoyed their best quarter-of-an-hour spell of the match, Raith took the lead in fortuitous circumstances. 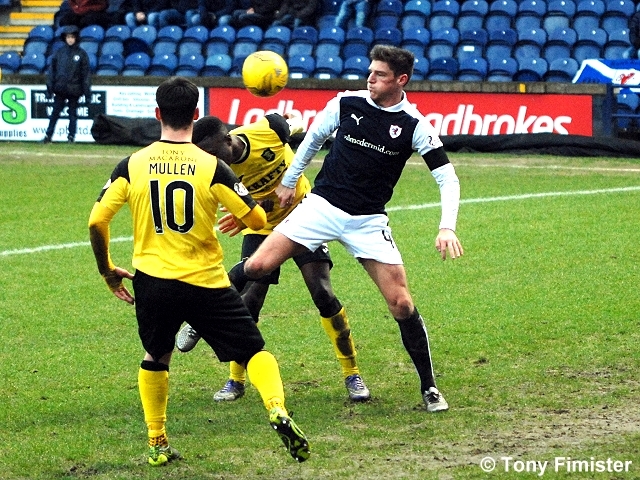 A drifting ball down the inside-right channel was played back beyond his keeper by defender Gordon, McCallum having advanced from his line, perhaps without alerting his colleague – a joy for the home support and a calamity for the visitors, the grateful Stewart stole in to walk the back-pass into the unguarded net for Raith’s opener. After a bright start, Livingston had faded in the second period of the opening half. 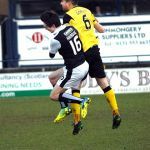 Barr and Davidson had not looked under undue pressure, and after a loose opening spell, Raith’s midfield were edging their counterparts. 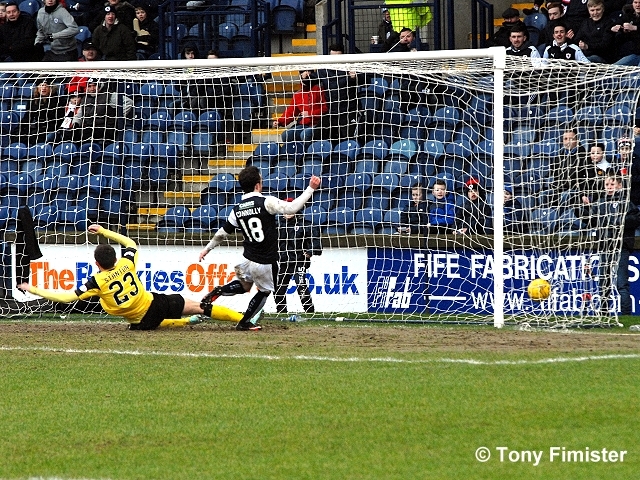 Panayiotou’s shot was perhaps more deserving of a goal than Stewart’s tap-in – either way, Raith were delighted to reach half-time a goal to the good. Two minutes after the restart, a second for the home side. The home midfield snapped into several tackles early on, no doubt warmed by half-time encouragement from their manager. 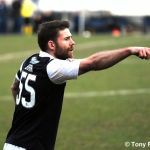 Picking up a good-looking ball in midfield, Panayiotou slipped in Stewart wide toward right-back Halkett – grappling with his opposite number, the Raith striker won the physical battle, squaring for Connolly to finish at the far-post. Stewart deserved the plaudits as much as the scorer – his battling prowess in close contact undoubtedly created the goal for his colleague. 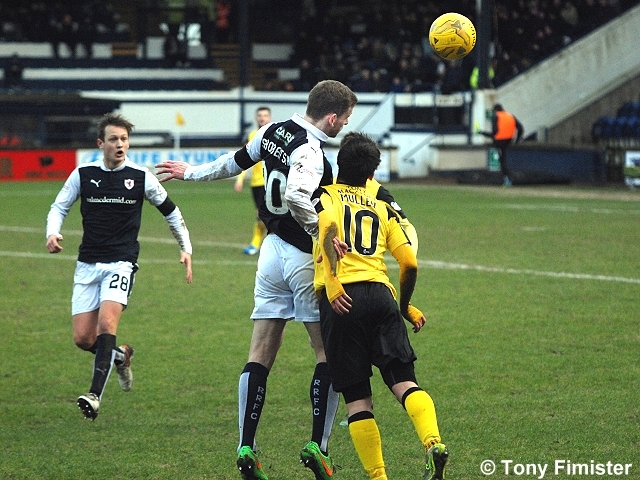 Raith sought to press home their advantage even further. 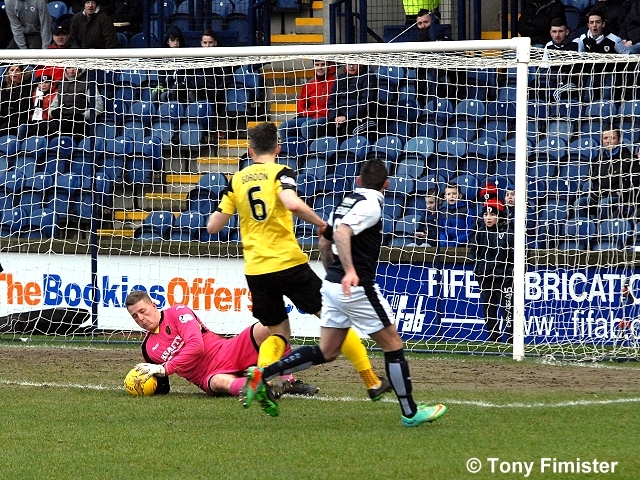 Callachan played in Stewart, with only a last-minute intervention from McCallum saving a third. Craigen’s deflected shot was saved. 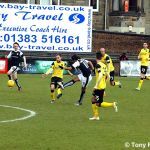 Livingston’s full-back Kakay – who had impressed in the first half with some assured control and no little energy advancing up his wing – stole upfield to shoot wide in Livingston’s first second-half foray into their hosts’ territory. Sensing a change was required, manager Hopkin made two alterations which changed the flow of the game – youngsters Telfer and Mullen were introduced for Pittman and a tiring Buchanan. With the addition of fresh legs, the visitors started to establish a foothold in the second-half, and as the match moved passed the hour mark, were clearly on top. 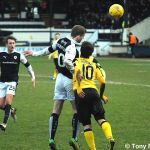 Buchanan had already swung and missed in a real rugby scrum inside the Raith box before Cole blasted a shot high over. McKeown rescued further danger as a quicksilver White breached Barr and Davidson’s defensive line. 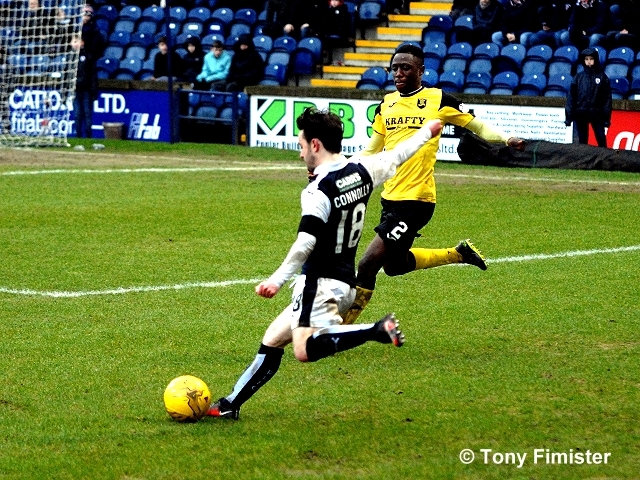 A golden opportunity was missed in the seventieth minute – with the ball lost in midfield, Kakay released White between Raith’s centre-halves, and – with Cuthbert advancing – the Livingston striker poked just wide. With quarter of an hour to go, a burst from Telfer on the right eventually saw the ball worked across to White’s right-foot – the front-man lashed his shot across goal, fading just beyond Cuthbert’s post. 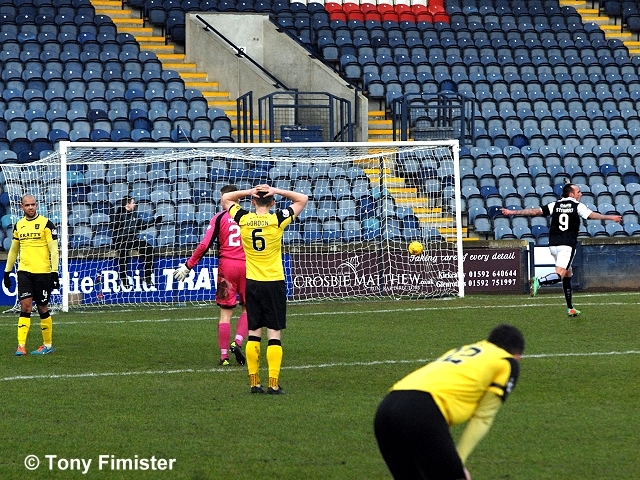 The agonised look on the Livingston striker’s face advertised the narrow margin by which the shot missed its mark. Rangers teenager Ryan Hardie was introduced with twenty minutes to go, replacing Panayiotou. 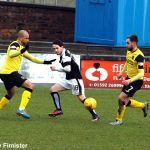 Moving straight upfront and clattering into Cole with his first tackle, his keenness to get involved provided a welcome boost to the home support in the cold February temperatures. The youngster leapt for high aerial challenges, slid into defenders, and offered a willingness to run – a welcome sight for his midfielders in the late stages of today’s game. Looking on approvingly from the touchline, manager McKinnon will have noticed the clear audition for a starting position in next week’s fixture. There was only one final chance for each side in the last ten minutes, as the pressure slowly eased from the match as a contest. At one end, visiting substitute Mullen burst beyond McKeown, cutting inside Davidson with a neat turn – both Davidson’s hand on his shoulder and the wet turf contributed to the striker’s fall. Referee Collum was unmoved by shouts for a penalty. At the home end, substitute Grant Anderson flew down his right-wing, eventually cracking a snap-shot at McCallum, the Livingston keeper collecting at the second attempt. 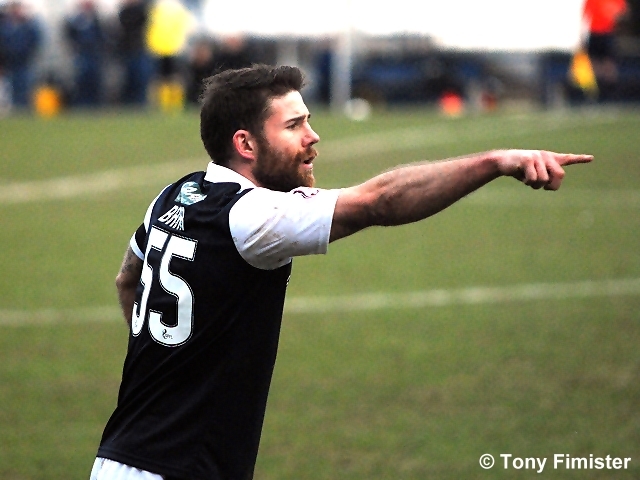 For the first time in several years, Raith now have a number of options upfront, with the recent additions of Connolly, Panayiotou, and now Hardie upfront – all of whom contributed well today. 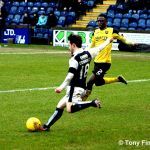 While the victory was deserved, Livingston created enough second-half chances to worry Raith, and to give manager McKinnon food for thought before next week’s encounter with Morton at Starks Park. Welcome to Starks Park. Rovers with an enforced change in defence - Barr makes his first start of the season. New signing Ryan Hardie takes his place on the bench. Fantastic tributes to Ally Gourlay on the pitch from some famous faces of yesteryear. Stanton whizzes a raking shot past Cuthbert's right post. Close! 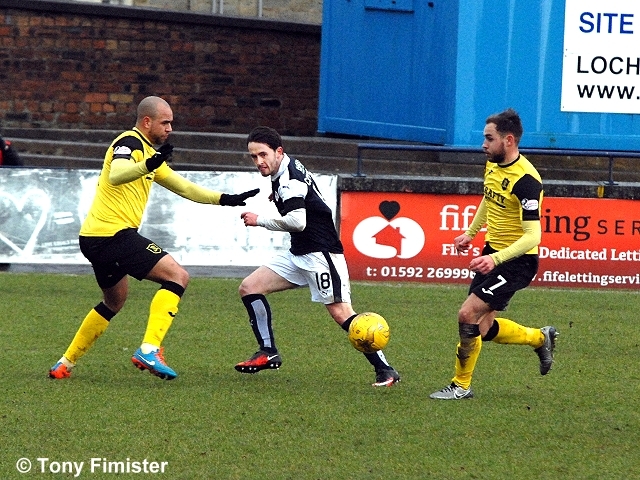 Fotheringham clatters Robertson. No card, despite it being much worse than Robertson's earlier offence. Terrific effort from Panayiotou! He cracked a strike against the underside of the bar from 20 yards with McCallum well beaten. 1-0 Raith! Stewart nets after a horrendous mix-up between Cole and McCallum! A solid if unspectacular first half. Barr and Davo dealing with everything comfortably, and Raith dominating the midfield. 2-0 Raith! Connolly nets from close range after superb work by Stewart! Stewart held off Gordon's challenge inside the box, then turned him inside out before crossing to the back post. 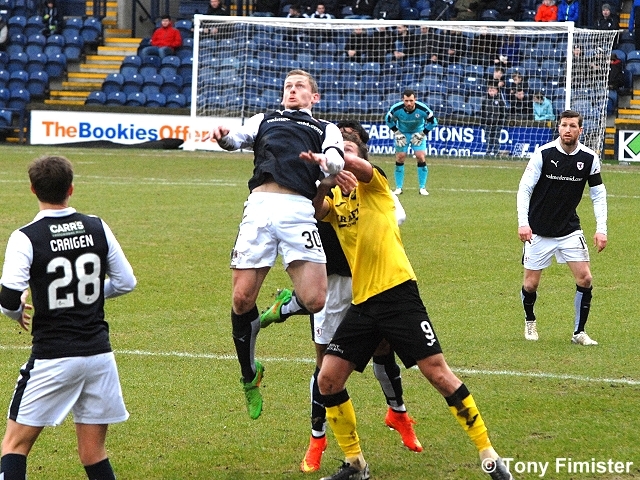 A stramash in the Raith box ends with Barr bravely heading clear. He was fouled in the process, but he's okay. 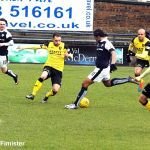 Livingston are the visitors to Stark’s Park this weekend, with David Hopkin’s outfit on a similar run to Raith Rovers, with both teams taking just two points from their last six league matches. 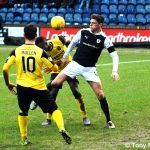 Those sequences have seen Rovers drop out of the play-off spots, while Livingston have been unable to clamber out of the relegation equivalent, although a whole host of new players have arrived at the West Lothian club in recent weeks, as they look to move away from ninth place. Charlie Telfer has arrived on-loan from Dundee United, while right-back, Osman Kakay has also arrived on loan from Queens Park Rangers. Sam Stanton has been acquired on a similar deal from Hibernian, while centre-half, Craig Halkett has been snapped up after leaving Rangers. The two meetings so far have produced six goals and a win apiece, with both teams producing 3-0 home wins. 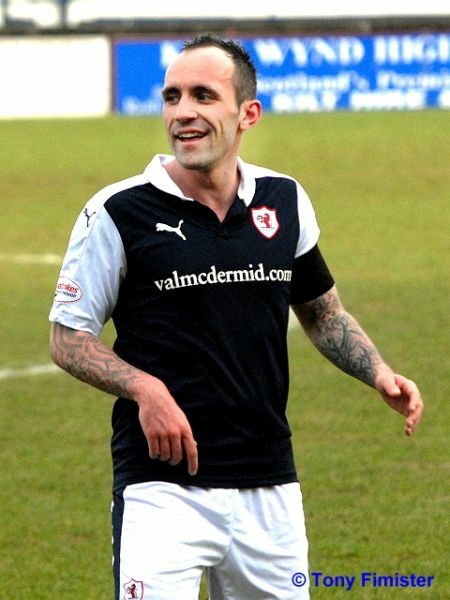 Raith began their Championship campaign with a 3-0 victory over Saturday’s opponents, with Mark Stewart opening the scoring after 10 minutes. 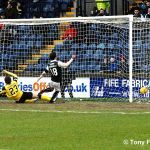 The goal-scorer was then brought down in the penalty box, allowing Ryan McCord to slot home the second from the penalty spot. Substitute, Mitch Megginson completed the scoring in added-on time. However, the return match was an entirely different affair, when a Jordan White double and a header from Declan Gallagher sealed a 3-0 win at the Tony Macaroni Stadium. 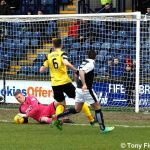 The result meant that Livi just edged the recent head-to-head record between the two sides, with six wins to Raith four from the last ten meetings. The last drawn match between the pair was away back in August 2012, when the pair played out a goal-less tussle at Stark’s Park.